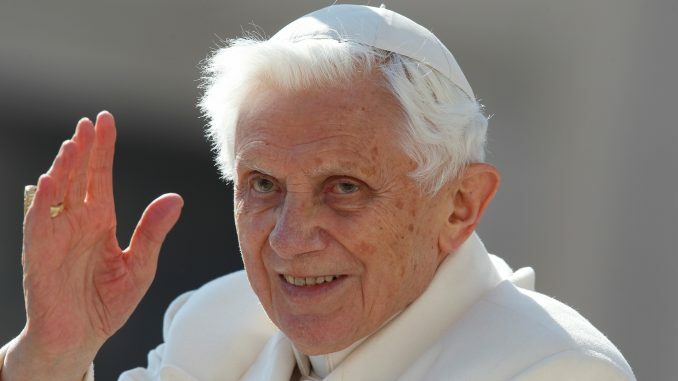 The emeritus pope’s essay was published simultaneously in German at Klerusblatt, in Italian at Corriere della Sera, and in English at Catholic News Agency and the National Catholic Register. “The phrase ‘the little ones’ in the language of Jesus means the common believers who can be confounded in their faith by the intellectual arrogance of those who think they are clever. So here Jesus protects the deposit of the faith with an emphatic threat of punishment to those who do it harm,” he explained. 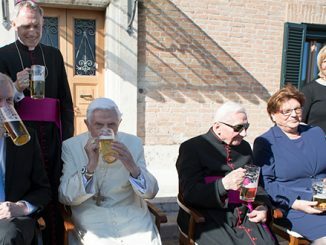 Certainly the Pope emertus puts things in the right perspective by emphasizing that the crisis in clerical morality cannot be taken in isolation and singled out in the light of the crisis of faith in Western society and among Christians in general. It is not logical to think that somehow the clergy is going to be immune to the moral sickness that now pervades Western culture as we can see in the daily news, legislative bodies, entertainment, the media, etc. The essay was basically to spread blame and deny responsibility. The problems are systemic and systematic — a rottenness to the core, centuries in the making, with no change or cure in sight. 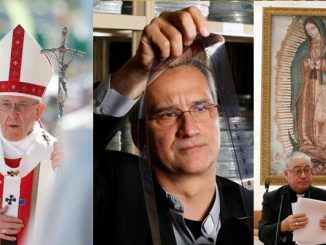 This is exactly why sexual abuse in the church needs to be addressed secularly in the criminal justice system and followed up with civil suits. It is also why women need to play a leading role in the church or move on. Nonsense. If your faith is so thin that you have to have power or you’re not interested, that would be your problem; don’t pretend that you are speaking for all women. Sadly, women are as likely to be corrupt as men. And if you’re talking about sexual abuse, the number of female teachers who have abused students is terribly high. I see you conveniently left out the critique of homosexuality in the priesthood and how it contributed to the decay. “Catholic” World Report indeed… Perhaps change your name. Ever a defender of truth Benedict adds “the Faith no longer appears to have the rank of a good requiring protection. This is an alarming situation which must be considered and taken seriously by the pastors of the Church.” That commitment to truth he says is found in Christ. And this is what’s lacking in pastoral care of the faithful. Purity is one of those goods, a forgotten virtue. A beautiful expression of love for others. 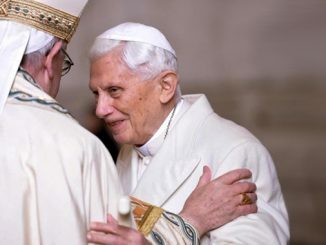 I have the sense he, Benedict is well aware of the crux of the crisis and may be on the verge of boldly addressing the sexual corruption within all clerical ranks. I pray so. Also Judgment impends for us all and eternal happiness or eternal pain becomes irreversible. As noted in comments we should pray for the conversion to Christ of all of us who have distanced ourselves from living his truth. Our Holy Mother the Church is made of Two Parts. Part One is the Spiritual Side of Her REALITY, that is the Presence of the Most Holy TRINITY Who is invisible to the human eyes, but is Visible to the Spiritual Eye ~~ the Source of Consecrate ing of the Hosts and the Forgiveness of our Sins by the Consecrated Hands of our Priests! The other part is made of HUMAN BEINGS across the globe ~ the HUMAN FAMILY~ The Sinners! The Function of the Church is: “For the greater glory of God and for the salvation of souls.” St. Ignatius of Loyola! I would add… “by the Sacrifice of Christ our Redeemer!” Yes, salvation comes to each of us through a very HEAVEY PRICE, that is the PASSION of Christ! “If you love me KEEP MY COMMANDMENTS!” John 14:15. The lack of Truthful LOVE for JESUS is the cause of the SINS within OUR CHURCH, nothing more! “But owe to you, Scribes and Pharisees, hypocrites! Because you shut the kingdom of heave against men. For you yourselves do not go in, nor do you allow those going in to enter. “Woe to you, Scribes and Pharisees, hypocrites! Because you devour the houses of widows, praying long prayers. For this you shall receive a greater judgment.” Matt 23:13-14. Never to be a HYPOCRITE! Jesus Will never loves someone who is one without Repentance!